James Dunne has shrugged off the statistic that underlines his importance to Pompey. The combative midfielder’s recent return from a knee operation coincided with an upturn in results as Pompey embarked on a seven-match unbeaten run. And while most Blues fans felt he was clearly missed during his two-month lay-off, there was evidence to back that up. 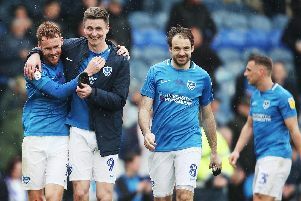 Pompey managed just one victory in Dunne’s absence – a 3-0 win over Morecambe back in November – which was their solitary success in eight matches without him. It’s the only time that Pompey have managed the feat throughout the entire campaign. But while Dunne claims he didn’t know about the statistic, he insists it is more important that the team return to winning ways against Luton tomorrow. Andy Awford’s side have suffered defeat just once in their past nine outings but they are bidding to end a three-match winless run after last week’s draw at Accrington. Dunne said: ‘I didn’t know about that stat. ‘But whether I’m playing or not, we’re a team. ‘I don’t look at stuff like that really. The former Stevenage man has made a welcome return to the ranks after his knee ligament problem, which was operated on after the Carlisle game in November. And his recovery was quicker than expected, as he made a surprise return as a substitute against tomorrow’s opponents in the reverse fixture back in December, which ended in a 1-1 draw. While Dunne is expecting a stiff challenge from a side that is challenging for the play-offs, he believes Pompey can rediscover their February form to chalk up a home win. He added: ‘Luton lost to Morecambe last week, which shows you what this league is like. ‘We’ve been playing well and getting wins. ‘Luton at home is a tough game still. ‘If we get back to how we’ve been playing it’s a game we can win, though. ‘If we play how we have been playing in February, we will pick up wins. ‘Then when it comes to six or seven games we can have another look at it to see where we are. ‘The passing has been sharp most of the time lately. ‘Maybe the final-third play hasn’t been brilliant. ‘But we have had a good run recently and we have to get back to that tomorrow.